Tell me about how you got into bicycling as an adult. I was living in Champaign, Illinois and a friend sold me a bicycle and I rode it a little bit there. I didn’t have a car and it was easier to get around on it. But I wasn’t into biking. I just rode it out of necessity. When I came back to Chicago in ’99, I had a car and I just didn’t really consider biking as a form of transportation. It wasn’t a conscious choice I made. But–and this was conscious–I lived on the South Side and I realized that biking is kind of frowned upon. People don’t think biking is cool so I thought, I’m not going to be seen riding a bicycle. People are gonna think I can’t afford a car or I’m weird. Around ’03 or ’04, I was dealing with a lot of stress at my job, family, and a personal relationship at the time. I’ve struggled with depression since high school. I’m working this high pressure job at CitiBank, struggling a little bit dealing with stresses at work. It turned into a severe bout of depression and I had to take a medical leave of absence. I was dealing with some intense pain and struggles just to do the basics. It was bad. It was too the point that I was trying to really figure out if it was even worth continuing to struggle like that. But in the midst of all that pain and darkness, I had moments of sort of exploring what other options there were other than taking my own life. It just kind of dawned on me one day that there’s an old bicycle in the basement and it could perhaps be a form of healthy escape. A way of sort of just getting out of my own mind. Getting out of my apartment, which had become like a cave to me, a protective shell where I wouldn’t let people in and I wouldn’t go out. I thought maybe riding on the lake could help. I went and tried it. That ride was transformative. It was just an incredible experience. In that ride I became a cyclist. I realized that for all types of reasons, cycling could help me with my depression. Part of it was the physical exercise and just getting out and moving. Part of it was the social experience–to get out early on a Saturday morning and say hello to people and they say hello back. You smile at somebody and they smile back. You give a head nod they give a head nod back. That was so social to me because I had been in this cave for weeks, maybe even longer than that. Then reconnecting with nature. The lakefront of Chicago is the jewel of our city–the water, the trees, the natural areas, the sun, the clouds. At that point I didn’t care anymore about dealing with the perceptions of this black guy on the South Side riding a bike. I wanted to be healthy mentally and riding a bicycle was more important than what other people thought of me. I wanted to heal. Amara Enyia and Oboi Reed on a Red Bike & Green ride. Photo courtesy Oboi Reed. Did bicycling quickly become a big part of your life after that first ride? Yes. After that ride I was still struggling with depression and still on medical leave. I made a decision that I would continue to explore cycling. I live in Chatham. It’s a neighborhood on the South Side. The option of riding my bike on the street just wasn’t there. It’s just too dangerous. I would always put my bike in the trunk of my car and drive to the lake. After that first ride I said I’ll just keep giving this a try. I enjoyed the experience, it seemed to help, seemed to clear my mind. I was battling between this desire to keep riding and intense depression. I could go a few days and really struggle, then get the strength to go for a ride. That process carried out for a few months where I’d ride once a week or so. Every ride gave me more and more clarity, more and more strength. Eventually with the help of family, particularly my brother, I put it together enough to really do some intense work to come out of this depressive episode. I went and saw a psychiatrist, started some medication, and eventually got healthy enough to where I could go back to work. I was happy to get my life back in order, get back to work. I kept riding cause cycling was part of my healing regiment. Now we’re talking a year or two of riding and doing other things to stay healthy. It was still bike in the trunk, drive it to the lakefront. That was the only way I rode. I started to think it would be cool to have some people to ride with, instead of always just riding by myself. I tried to get family and friends to ride. I would ask my brother and father to come and ride with me sometime. They’d give me the platitudes. “One day. Sounds interesting.” They’d never do it. There was always an excuse: didn’t have a bike, bike not working, whatever. Then there was sort of a series of events that happened. I reconnected with an old friend. I found out she was into biking. We decided to go for a bike ride together. She hadn’t ridden for a while so her bike needed some work. She drove to my place. We put the bikes on the rack and drove to one bike shop in my neighborhood. They couldn’t fix her bike quick enough for us to still go for a ride so we drove to a neighborhood called Beverly, a little further southwest than Chatham. The shop there fixed her bike relatively quickly and since we were now kind of far from the lake, we asked them if there were any trails around that we could ride on. They told us about the Major Taylor Trail. We’re on this trail riding and a big group of young black children–maybe 50 of them–are riding up in a single file line with an adult on the right hand side. I was just blown away. Number one, you don’t see a lot of black folks biking and two you don’t usually see children riding in an organized way like that. I was curious as to what’s going on so I talked to the older brother. He told me it was a bike club that he runs as part of a summer program. It inspired me. I thought perhaps starting a bike club was a way to get people to ride with me. I told the young lady I was with that moment that I’m going to start my own bicycle club. One of the websites I reached out to was Grid Chicago, which was run by John Greenfield and Steven Vance. John emailed me back right away and said, “I would love to write about you.” I didn’t really consider the Pioneers as much of an advocacy effort, it was just getting together with family and friends to ride. 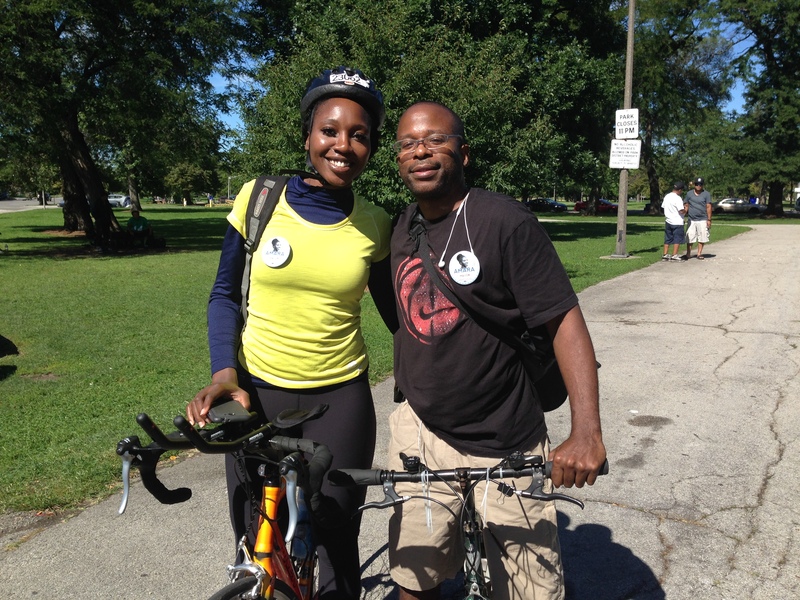 John saw it more as organizing work and advocacy work and introduced me to the world of bike advocacy in Chicago. He connected me to a lot more people, introduced me to some organizations and events and I got launched into this world of bike riding as a tool for improving people’s lives, not just doing it for fun. Is that when you started getting involved in Red Bike & Green? I kept doing the weekly Pioneers ride for a few years. Then I wound up living in Brazil for six months for school. Right before I left, I met a young lady named Eboni Senai Hawkins. She founded Red Bike & Green Chicago. I had heard about RBG. I loved what they were doing, knew they were coming to Chicago and wanted to connect with them anyway. As I’m wrapping up my time in Brazil and preparing for my return, I started telling the Pioneers, yo I’m coming back. They’d sort of gone into hibernation. But I told them they had to get ready to ride. I reached out to Eboni and said hey let’s work together on stuff. I reached out to John Greenfield. He suggested we lead another Critical Mass ride to the South Side. Eboni and I felt that was a great idea and the ride happened within a few weeks of my return. It was huge. We had thousands of people out there. We took them all the way south to Hyde Park. It was incredible to take that many people into the South Side of Chicago. The city is so segregated by race, by income level. A lot of people who ride with Critical Mass may not get south that often. To take that many people south to really see the beauty of our neighborhoods, see the beautiful people was really transformative for me, transformative for a lot of people on that ride. After that, I was still trying to get the Pioneers together, me and Eboni are still exploring ways to work together with RBG. Eventually, I thought it really didn’t make sense for me to keep working on both because they have very similar intents: Getting black folks riding. We decided to fold Pioneers into RBG, we asked everyone who used to ride with use to come and ride with RBG, and Eboni and I started to organize RBG together. That just happened early spring 2014. How did you bring Slow Roll to Chicago? Around August of last year, myself and my Slow Roll Chicago co-founder Jamal Julien–who I’ve been the best of friends with since fourth grade–were sitting around one day at my place chatting. We had both seen a video from Slow Roll Detroit and were inspired by what we saw. It was just an incredibly big ride. Incredibly diverse. The bike club in the video is these brothers riding, they got they vests on like a motorcycle club. They were all riding custom old-school cruisers. We were both like, “man, what is this?” For the next few weeks we followed them from afar. We joined their Facebook group. We were watching their videos, seeing their energy and spirit, and decided we would love to bring this same thing to Chicago. We reached out to Mike MacKool, one of the co-founders of Slow Roll Detroit. At that point it had become a global movement with chapters around the country and world. We worked with him to try and get things going. We thought we’d call them and be able to start a chapter the next day, but it was moving a lot slower than that. Then me and Jamal were hanging out and happened to see a link on Facebook about Apple and Slow Roll Detroit. It didn’t quite make sense. What do Apple and Slow Roll have to do with each other? We click on the link and it’s the commercial. You’re talking about some people that’s blown away? We were blown away. As big as Slow Roll Detroit was, I never imagined Apple would feature them in a commercial. They’re featuring a dark skinned brother who doesn’t fit the bill of a commercial success in this country, doesn’t fit the bill of a Eurocentric perspective of beauty. It’s set in Detroit, a city with as much beauty as there are challenges. That’s all amazing to me. We found out as part of this campaign, Slow Roll’s Jason Hall was traveling around the country and speaking at Apple Stores and he was set to speak here in Chicago. I go, connect with him, and literally days later we seal a deal with Slow Roll Detroit. We officially launched our chapter in Chicago on September 20. Oboi Reed (in green) on a Red Bike & Green ride Chicago Velo Campus. Photo courtesy Oboi Reed. What are the Slow Roll rides like? We were deliberate about our Slow Roll Chicago chapter being a tool for transforming communities. We set out to put structure in place to allow that to happen. We started in September, so weather wasn’t on our side. For our launch season we decided that we would ride from September to November and we wanted to just ride once a month to get things started. We agreed that every ride was going to be done in partnership with community-based organizations. For the launch ride we did it in the neighborhood Jamal and I grew up in, Chatham. We started at a local, black-owned, woman-owned cafe and went to Bronzeville to another black-owned, woman-owned coffee shop. The second ride we did in partnership with a predominantly black church in a neighborhood called Roseland and we worked with several community-based organizations in addition to the church. Then for our final official ride of the season, we partnered with the Chicago Police Department’s Community Policing division in a neighborhood on the west side. We rode to the Museum Campus part of downtown in a beautiful area called Northerly Island. We want to ride all over the city, but we want to focus on the South Side and West Side. These are not strong white neighborhoods. They’re neighborhoods really in need of bicycle love in Chicago to get more people riding and get all of those inherent benefits that come with: Healthier people, healthier communities, safer, less violence, more retail, more jobs. We want all of those benefits that people on the North Side and downtown get to experience, we want those in our neighborhoods as well. 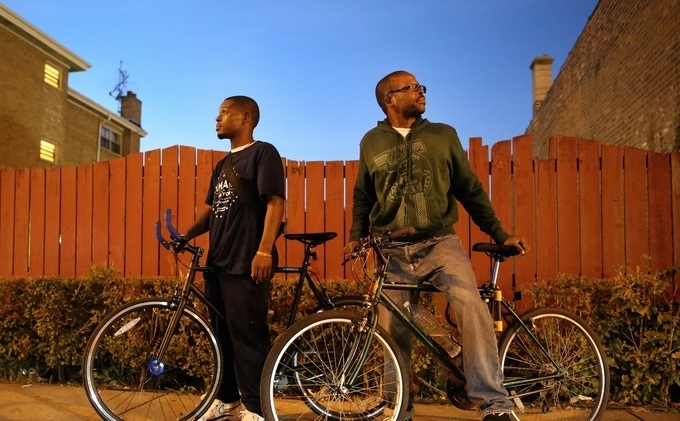 What are some of the barriers to bike equity in Chicago? There are, of course, many reasons for inequity. Some people say that the biggest road block is black aldermen in Chicago. Black people want to focus on violence prevention and job creation so anything that’s perceived as taking resources away from those two priorities is considered frivolous. Because it’s seen as frivolous or something that kids do or only white people do, people ask why we are putting so much time and energy into this. Elected officials, aldermen in particular, they make a calculated choice: Why should I spend political capital on something people in my community are not excited about? We recognize in order to achieve bike equity in this city, especially when it comes to bike infrastructure, we need community leaders’ support, we need parents and grandparents support, and we need the aldermen’s support. Now, aldermen not the only barrier. There’s this institutional inertia within CDOT, within the mayor’s office, within the state DOT to continue what’s always been done. The philosophy within those institutions is that the parts of Chicago that bike the most deserve the most bicycle resources. Our position is: no, the communities that bike the least deserve the most bicycle resources. We’re fighting for equitable ridership across the city. We want the same number of people riding in Wicker Park as the number of people riding in Inglewood. In order to get there, right now, you have to invest more in Inglewood than you do in Wicker Park. If you invest the same level of infrastructure or programs or Divvy stations in both neighborhoods, Wicker Park’s ridership will always remain higher. Until there’s parity around the number of people that bike across our city, we feel there needs to be more investment in neighborhoods that are predominantly people of color, neighborhoods with low to moderate income. There’s been a lot of publicity around these issues lately and you’ve got all these good things happening such as Slow Roll Chicago and Red Bike and Green. Do you feel like progress is being made towards that goal? I feel like people are listening in a new way. It’s too early to say progress has been made. I do believe there’s more attention, there’s more energy, there’s more talk about the necessity of making equity a priority when it comes to bicycle infrastructure and bicycle culture in Chicago. And that is a step in the right direction. It’s not enough. We’re not satisfied by having an elevated conversation about this. We want results. We want to know there’s increased infrastructure coming. We want to know there’s more aldermanic support for this coming infrastructure. There’s some things we’re already doing. We’re aggressively doing outreach to community leaders and aldermen within our coalition to build up this community support for a stronger bike culture in predominantly-black neighborhoods. We’re doing Slow Roll Chicago, which again, is committed to riding all over the city but with a particular focus on black and brown neighborhoods. Our season starts in April and we’re going to do a lot of rides. We’re doing the work of inspiring people to ride, encouraging people to ride, showing them they can make their neighborhoods rideable. We’re working on a bike equity data project with Steven Vance. He’s leading a charge with me on that project and we’re going to present our early findings from that data project on January 27th at the Open Gov Hack Night. We have some intentions of further developing that data, doing analysis, and eventually presenting it in a formal way to the city and state to show them what we believe is true, that bike infrastructure is inequitably distributed. We want to use data as a rational, logical way to compel and push them to change their approach to how bicycle infrastructure in distributed in Chicago. Our comprehensive approach is that all of these things take place at the same time. We inspire people to ride. The city and state give people the infrastructure they need to feel safe. We do our advocacy work to generate community and elected official support. We do the scientific work to show the city it’s inequitable. All of that work is pushing towards one common goal of equitable ridership across geographies, across race, and across income levels. 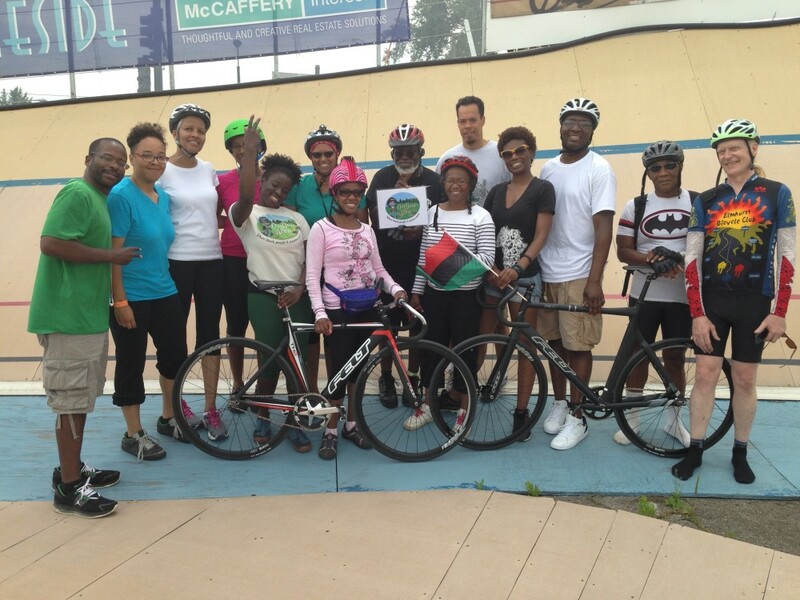 This entry was posted in Adventure, Uncategorized and tagged bike equity, chicago critical mass, chicago cycling, eboni senai hawkins, grid chicago, jamal julien, mike mackool, oboi reed, red bike and green, slow ride chicago, slow ride detroit, steven vance. Bookmark the permalink.